Ayurvedic and Dermatology Treatments: Are you battling against Psoriasis? Are you battling against Psoriasis? Do you have red patches with silvery scales on your skin? Are those patches bleeding as well as giving you unendurable itching and burning? Have you got swollen joints coupled with thickened and ridged nails? Consulting a skin specialist at the earliest is the only solution if these are concerning you because there is a huge probability that you might be diagnosed with psoriasis. Don’t worry! Managing the symptoms efficiently and adopting certain changes in your lifestyle will save you from this chronic skin disease. Psoriasis is of course, non-infectious and usually happens because of the increase in the skin layers as a result of cell division in the base layer of the skin. Which means, in a way, the immune system of the body begins working against its own body tissues. Ayurveda is of view that every individual is made up of three kinds of energies (doshas) such as vata, pitta and kapha. Any imbalance in any of these would affect the optimal health of the person. 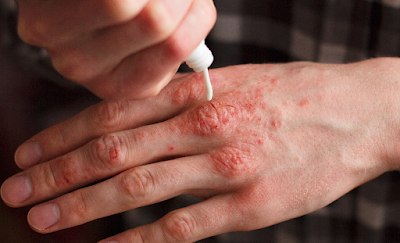 The involvement of doshas in psoriasis vary among individuals. Though it is considered as a vata kapha predominant disease, the association of pitha and rekta in the pathology should also be assessed before treatment in each case. Complicated stages of Psoriasis affect even bones and joints. The types and intensity of Psoriasis may vary from person to person. A few of them are Plaque Psoriasis, Guttate Psoriasis, Pustular Psoriasis, Erythrodermic Psoriasis etc. 1. The body nature(Prakriti) of the patient is evaluated first. Imbalance in Tridoshas ie. Vata, Pita, Kapha assessed and the stage of the disease is identified. 2. The patient is prepared in advance before the main treatment with the aid of medications for Deepana and Pachana. These medicines are very much required to clear off the undigested materials and helps increase the metabolic functioning of the body. 3. 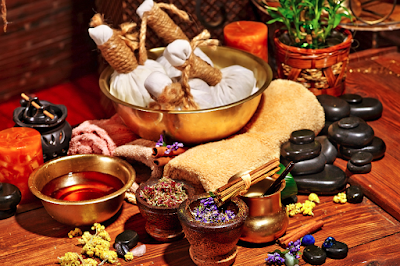 Through Panchakarma treatments, the toxins from the body fluids are eliminated and the whole body is detoxified. Panchakarma consists of Vamana, Virechana, Vasti, Raktamokshana and Nasya. 4. Internal medicines along with external applications are then given to stabilize the vitiated tridoshas. 5. In order to prevent the recurrence of the disease, Rasayana treatment is carried out. It aims at improving the longevity of the individual enabling to have a better immunity and enhancing tissue turnover. 6. A strict healthy diet will be advised by the physician that ought to be followed by the patient regularly. The treatment for Psoriasis can be effective only if the patient accepts all the modalities of the treatment and the strict diet regimen wholeheartedly. Amrita Ayurvedic Centre is one of the eminent Ayurvedic healthcare centres offering Ayurvedic skin care in Kerala and the best Psoriasis treatment in India. The centre run by Dr. R.S. Roy is excellent in providing clean and fully equipped accommodation for its patients apart from the other quality services. Are you looking for best dermatologist in Jalandhar? Then look no further and book an appointment with Dr. Mohan Singh. He is one of the top-most skin specialists in Jalandhar that provide best vitiligo treatment, laser hair removal, acne treatment and skin related issues. Thanks for comment, Here you can check the Jaipur best Melasma clinic and treatment center. If you Melasma keep infections out of your body and keep you from getting sick. They must visit at delight skindent wellness clinic website and get appointment for Melasma treatment in Jaipur.